The mission of Camp Impact is to provide a week of recreation that emphasizes group and individual activities for children of diverse backgrounds. The hope is to build their self-esteem and confidence, “impact” these children and provide them with a once-in-a-lifetime experience. 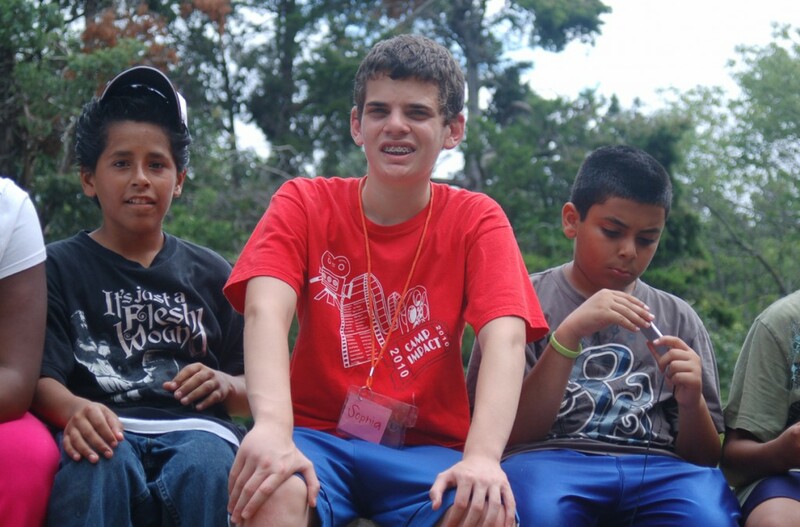 Camp Impact, which is run by Arlington’s Congregation Beth Shalom, will take place from June 10-14 at Camp Whispering Cedars in South Dallas. About 100 first through sixth graders from various shelters in Arlington and Grand Prairie attend the camp and are picked up and dropped off each morning and afternoon. This camp is a wonderful experience not only for the campers, but also for the 50 counselors as well, according to director Al Fratina. The counselors are eighth through 12th graders who are members of the Beth Shalom youth group, ARFTY, and the National Federation of Temple Youth (NFTY) and some even come from Houston. They have attended five monthly meetings to prepare and train for camp. Camp Impact has officially been running since 1996 when it was only one or two days. Fratina took over as director in 2002 and expanded the camp to five days. The day begins at 8 a.m. when the campers and counselors join for breakfast, and that’s followed by arts and crafts, swimming, science and other educational activities, lunch, speakers and more. The last day, campers act out skits and participate in a camp-wide carnival that features water slides, games, a photo booth and balloon and sketch artists. Every child receives a backpack on the last day of camp filled with notebook paper, pencils and a ruler. Putting on the camp is rewarding, but not an easy feat, Fratina said. It costs anywhere from $20,000 to $30,000 to run it each summer. 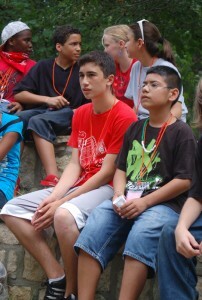 Camp Impact is funded by donations and each counselor is required to pay $125. Sam Weiger, forefront left, with campers during Camp Impact. The bonds he forms with the campers and the other counselors is part of what he enjoys each summer, Weiger said. He also likes sharing with the campers what he has learned from his parents and teachers over the years. Carly Williky, a senior at Grapevine High School, will be a counselor for a third time this summer. She enjoys meeting the campers and hearing their stories, she said. She also takes away important lessons and it’s always an eye-opening experience for her, she said. Camp Impact is still accepting monetary donations and items for this summer. For information, contact Fratina at frat32@gmail.com. The flags that our Jewish War Veterans this past Monday, Memorial Day, are still waving on the graves of their deceased comrades. In advance of the holiday this year, I made a presentation to residents of the Legacy/Preston Hollow who, like I, are old enough to remember reciting the poem “In Flanders Fields” in our school days. None of us were dry-eyed when I read it aloud. Now seems a like good time for younger people to also learn these lessons about our history. First, about the poem: Major John McCrae, was a military doctor, second in command of the 1st Brigade Canadian Field Artillery just north of Ypres, a strategic Belgian site during World War I. Lieutenant Alexis Helmer had become McCrae’s good friend during the fight against the Germans in what people called then, with naive optimism none of us has seen since, “the war to end all wars.” The brigade had arrived there on April 23, 1915. On the morning of Saturday, May 2, Helmer stepped out of his dugout to be cut down instantly by a direct hit from an 8-inch enemy shell. He was 22 years old. No grave was dug for him because there was no body left. Helmer’s comrades gathered all that could be found of his scattered remains into sandbags during brief moments of no shooting. That evening, the bags were wrapped in an army blanket and laid in a shallow hole scooped from the earth. The brigade’s commanding officer and chaplain had been called to duty elsewhere, so McCrae conducted the brief memorial service and marked the place with a small wooden cross. “A couple of hundred yards away, there was the headquarters of an infantry regiment, and on numerous occasions during the 16-day battle, we saw how they crept out to bury their dead during lulls in the fighting. So the rows of crosses increased day after day, until in no time at all this had become quite a sizeable cemetery. Just as John described it in his poem, it was not uncommon early in the morning to hear the larks singing in the brief silences between the bursts of the shells and the returning salvos of our own nearby guns. … ” This burial ground on the west bank of the Ypres-Yser Canal, at the time of Helmer’s death primarily a dugout for medical bunkers, eventually became the Essex Farm British Military Cemetery. If you visit the Belgian World War I battlefields today, you’ll see Jewish stars and crosses at Essex Farm and other cemeteries. The markers for known dead are marble now, and to avoid the inevitable staining that follows when rain-washed stones picked from the ground and placed on Jewish graves, sterile white aquarium pebbles are provided. “In Flanders Fields” is not just a beautiful poem; it incorporates a subtle truth that most readers miss, but a doctor like its author would know. “If ye break faith with us who die,” he wrote, “We shall not sleep, though poppies grow in Flanders fields.” Poppies are a narcotic; the dead voice that speaks out in this poem threatens us into eternity: if we do not take up the fight for peace and freedom, those who lie there will never rest – not even though they are already dead, not even under a blanket of flowers that can put the living to sleep. As the school year comes to a close, we look back on how we have grown. With our little ones, it is easy to see the physical changes and even the intellectual and emotional growth can be observed. But how do we teach our children to have faith and how can we measure spiritual growth? Talk with your children about wonder and, most importantly, talk about God. The ease with which young children talk will strengthen your own faith. Our children are indeed strengthening their roots and are growing strong. As we enter the summer months and the pressures of the school year are over, take time to enjoy our natural world. Don’t let the heat, bugs or dirt keep you inside. When asked about times when we have felt God’s presence, most people talk about times in nature viewing the creation of God rather than looking at man’s creations. When I was an 18-year-old counselor many years ago, I stood with my group at the Grand Canyon. Most of us experienced the wonder of the moment, but one young boy said, “It looks just like the train ride at Disneyland.” From that moment on, I was committed to giving children experiences to love the outdoors. Seeing the world with the fresh eyes of our children gives us faith that the world is a good place. A story is told of a young student who questions Rabbi Akiba about the nature of faith. The rabbi brought the student over to a sprout in the ground and said, “Pull it up.” The student does so with little effort. They walk on to a sapling and again Akiba says, “Pull it up.” This took more effort, but was done. And then on to a shrub which took all the student’s strength to uproot. Finally, Rabbi Akiba takes the student to a fully grown tree, and, try as he might, the student could not move the tree. I often wax nostalgic this time of year when I think of my hometown of Fort Worth, particularly Beth El’s closing religious school exercises. Last week, I asked my own 9-year old, Jimmy, about Congregation Shearith Israel’s final assembly. I wasn’t able to attend, because it coincided with Akiba Academy’s graduation and my niece, Rosie Bernstein, was a graduate. Jimmy said, “It was pretty good, lots of singing and the presentation of the ‘Kiddush Cup’ awards.” This was a great opportunity for me to share with Jimmy my favorite memory of Sunday school at “the Temple.” I shared with him how Rabbi (Bob) Schur gathered everyone in the sanctuary and gave essentially the same message year in and year out of which I’ve never tired. His prescription for the perfect summer: “Read a good book, take a long walk and make a new friend.” I’ve written about this many times, because it made such an impression on me and to this day, I try and live by this edict. Jimmy’s comment? “Sounds like a pretty good idea, I’m going to do that this summer.” Then I told Jimmy the whole community convened at Burger’s Lake afterward. I never was able to master that rope swing. When the Jewish Federation of Fort Worth and Tarrant County holds its annual meeting next Thursday, June 6, honoring the retiring Mort House will be at the top of the agenda. House’s tenure at the federation will come to a close Aug. 31 after 11 dedicated years at its helm. House joined the federation Sept. 1, 2002, after serving as executive director of the Dayton (Ohio) Jewish Community Center and, before that, as assistant director of the Jacksonville (Fla.) JCC. The annual meeting is open to the community. Program director Angie Kitzman and meeting planners are eager to get a headcount for the evening’s festivities which begin at 7:30 p.m. at Beth El Congregation, 4900 Briarhaven Road in Fort Worth. Angie is also collecting notes for Mort, which will be presented to him at the meeting. Rounding out the program will be Southwest Jewish Congress director Gil Elan who will speak on current events in Israel. To RSVP, contact Kitzman at jfed@tarrantfederation.org or 817-569-0892. Congregation Ahavath Sholom has your summer planned for you with its 2013 Summer Film Festival. The film festival is free and open to the community. Seven films will be shown on Sundays starting at 6:30 p.m. (after the evening minyans) from June 9 through Aug. 18. The films have been carefully chosen to interest everyone, and moderators will lead the discussions after each film. The films are CAS’ gift to the community and the popcorn and cold drinks are complimentary as well. A special “thank you” goes out to the Jewish Federation of Fort Worth and Tarrant County for supporting the Summer Film Festival. On June 9, “Chariots of Fire,” which won the Oscar for Best Picture in 1981, will be moderated by Posy McMillen, founder of Yad B’Yad, the organization for reconciliation between Jews and Christians. On June 23, “Jews and Baseball: An American Love Story,” will be moderated by Murray Cohen, CAS president and an avid baseball fan. Wear your favorite baseball gear while you enjoy hotdogs for this one. On June 30, “Footnote,” an award winning Israeli film about a father and son who are rival professors in Talmudic studies, will screen. This film will be sponsored by the TCU Jewish Studies Program whose director, Dr. Ariel Feldman, will lead the discussion after the showing of the film. On July 14, “Arranged,” an Israeli film about two young women, an Orthodox Jew and a Muslim, going through parallel experiences of arranged marriages. Sponsored by the Ladies Auxiliary of Congregation Ahavath Sholom, the film will be moderated by Cantor Shoshana Abrams and Dr. Jane Pawgan. On July 28, “Victim No. 17,” an Israeli documentary about a terrorist suicide attack during the Intifada, will be on tap. One of the victims, Number 17, was unidentified and this story is about the search for his identity. Sponsored by Congregation Ahavath Sholom, Rabbi Andrew Bloom who served as a medic in the IDF, will lead the discussion. On Aug. 11, “The Magician of Lublin,” based on an Isaac Bashevis Singer story, will screen. This film stars Alan Arkin playing a Jewish stage magician, conman and mystic who tours Eastern Europe while his personal problems begin to destroy his career. Leading Houdini expert Arthur Moses, along with a local magician, will cast a magic spell over all who attend in the discussion that follows. On Aug. 18, “Follow Me,” the story of Yonaton Netanyahu, the hero of the Entebbe raid which saved 103 hostages from Idi Amin’s hands, will conclude the series. Yoni was the only Israeli casualty and this story is about him. Sponsored by the Southwest Jewish Congress (SWJC) whose CEO, Lt. Col. (res.) Gil Elan, will lead the discussion after the showing of the film. The Summer Film Festival is sure to be a success and hopefully will be an annual event for Congregation Ahavath Sholom. Committee members are Liz Chesser, Kate Cohen, Hedy Collins, Bruce Miller, Jane Pawgan, Debby Rice, Reggie Rog, Jayna Sosland, Jim Stansbury and Louise Vermillion. Andy Brewster (Seth Rogan), an inventor, invites his widowed mother, Joyce, (Streisand) on a cross-country road-trip as he tries to sell his new product (an environmentally-friendly cleaning fluid). While on this sales trip across America, Andy and Joyce have to deal with long simmering family tensions that neither wants to confront. Andy does not truly want his mother on the trip, but he wants to reunite her with a long-lost first love. Across 3,000 miles of ever-changing landscape, he is constantly aggravated by her antics, but over time he comes to realize that their lives have more in common than he originally thought. His mother’s advice might end up being exactly what he needs. The program includes all the popcorn and ice cream you can eat, plus the film for only $5. Reservations are requested, so there will be enough ice cream for all. We can order no fat, low fat, lactose and sugar free if you tell us your needs when you reserve. For information and reservations, call with your credit card to Barbara Rubin, 817 927-2736, Larry Steckler, 520-990-3155, or Hugh Lamensdorf, 817-738-1428, or reserve for yourself at www.bethelfw.org/donations. I’d like to think that most times I under promise and over deliver. Last week, I promised that we’d report on Marvin Blum’s Q&A with Warren Buffet. We haven’t forgotten that promise, and hope to have it for you next week, when we have a little more space to work with. Until then, that’s a -30-. This week we sadly lost a pivotal figure in the history of the Dallas Jewish community, Mr. David Rosenberg ob’m. Since most of you were not present at the funeral, I wanted to share with you thoughts expressed there. It is very important and appropriate that members of a community are aware of a great leader who has been lost to them. This is especially true when many of our lives have significantly been touched by this man, directly or indirectly, without many of us even knowing it. Mr. Rosenberg was a man who discreetly gave so much of his time, resources and caring toward the founding, building and sustaining of many of our local institutions; including Congregation Shaare Tefilla, Ohr Hatorah, Tiferet Israel, Akiba Academy, Torah Day School of Dallas, Yavneh Academy, Mesorah High School for Girls, Chabad of Dallas, NCSY, Jewish Federation of Greater Dallas, the Dallas Holocaust Museum/Center for Education and Tolerance, and the list goes on to include many more local, national and international institutions. A couple days before his passing, I sat with Mr. Rosenberg in his hospital room, surrounded by his wife, children and grandchildren reciting Tehillim/Psalms in prayer for their beloved husband, father and grandfather. I held his hand for a long while, and as long as life pulsated in that hand I could feel all his warmth, loving and caring. I also felt that his hand was my last chance to hold hands with the Jews of his native Czech town of Bardiav with all its pre-war holiness and purity, its sages and simple, devoted Jews. I was holding hands with his holy ancestors from the Sanz-Stropkov dynasty; with all of Europe’s Jews from a bygone time; holding hands with generations back to Sinai. In his warm, soft touch I was able to feel the strength and resilience of the Jewish spirit which, with his deep faith, gave him the resolve and tenacity to survive the inferno of the Holocaust. Not just to survive, but to stand up and shake off the ashes, and together with his wife who was the love of his life, to build a proud family of Jewish leaders and builders. This was the strength to build a financial empire in a country where he couldn’t even speak the language, and to utilize that empire to build a spiritual empire where Torah and the lessons of the past became vibrant in the present and serve as a foundation for the future. The strength of the Jewish people is that we are deeply rooted in our past, fully living in the present and actively building the future. Mr. Rosenberg was rooted in his glorious past, in the simple burning faith of his forebears. This gave him the fortitude to never miss a day in the camps to, somehow, don his tefillin. He adopted and lived his forebear’s life theme of happily accepting whatever came his way as “besheret,” that’s the way “the Oibershter feert the velt,” the way God runs the world. He brought that message into the present, where he ensured that world of the past would be relevant for his children, grandchildren and community through the multiple Jewish institutions he participated and built, many in partnership with his brother Mr. Marcus Rosenberg ob’m. And in the schools he built and cared so much for, he was ensuring a Jewish future. I was deeply touched to tears when I learned that his procession would first be stopping at Torah Day School where the children, hundreds of HIS children, would come out of the building to recite Tehillim and pay their last respects to the man who was largely responsible for all they learn. May we continue to feel the warmth of his loving hand in the continued growth and success of our community and all he built. May he rest in peace, and may his family be comforted among the mourners of Zion and Jerusalem. It is hard to believe that my nephew, Benjamin Ray, son of Sharon Wisch-Ray and Alex Ray, is graduating from Richardson High School next week. I could not help remember the surprise in store for me on the evening of my own high school graduation many decades ago. I had just been handed my diploma, when my parents, the late Rene and Jimmy Wisch, pulled me aside to tell me that the family was getting a wonderful graduation present. They proceeded to tell me that my mom was pregnant. I remember the excitement so well. Sharon was born the week that I left for Stephens College. She was an adorable and perfect baby, and of course, being far away, I missed her immensely. When I returned home after college, Sharon became my “roommate” until I left home. Although, I am fairly certain, that there are no such surprises in store for Benjamin and his brothers, Sam and Jimmy, I want to wish him the best at Texas A&M. Ben is the grandson of Jane and the late Gayle Ray. That same weekend, I will more than likely shed a tear or two, as my granddaughter, Elizabeth “Shea” Doty, daughter of Amy Davidsohn Doty and Tim Doty, (and sister, Jessica) celebrates her bat mitzvah at Nishmat Am in Plano. Shea is the granddaughter of Eli Davidsohn of Plano and Bruce and Phyllis Doty of Carrollton. She is the great-granddaughter of Mary “Omi” Davidsohn of Houston. These markers on the road map of life become the memories that keep us all connected. Rabbi Hanan Schlesinger has been named a Memnosyne Institute Interfaith Scholar, a program initiated by The Center for Interfaith Inquiry at the Memnosyne Institute in Dallas. The Institute’s interfaith efforts bring together scholars and practitioners of all faiths who seek common ground for understanding and practical service to humanity through a cooperative and collaborative approach. Rabbi Schlesinger is the newest addition to the Interfaith Scholars initiative. He joins the Memnosyne Institute with over 20 years’ experience in teaching Jewish studies, dividing his time between Dallas and Israel at various colleges of Jewish studies, synagogues, seminaries, mosques and churches. He currently serves as founder, executive director and community rabbinic scholar of the Jewish Studies Initiative of North Texas. Rabbi Schlesinger was previously affiliated with the Community Kollel of Dallas for five years. Rabbi Schlesinger is a member of the Rabbinical Council of America and the International Rabbinic Fellowship, as well as a member of the Rabbinic Association of Greater Dallas. He is a recipient of a Rabbis Without Borders Fellowship, which is sponsored by the National Jewish Center for Learning and Leadership. He also created “Faiths in Conversation,” a Jewish, Christian, Muslim interfaith dialogue series sponsored by the Memnosyne Institute, where he is also a leader and participant. The Memnosyne Institute’s mission is to help the diverse people of the world consciously encourage an evolution for themselves and for future generations by providing mankind with the means to encourage positive, peaceful global collaboration in areas of knowledge. Founders of the Memnosyne Foundation are Mary Ann Thompson-Frenk and her husband, Joshua Frenk. Both founders emphatically stated that Rabbi Schlesinger’s knowledge of Judaism from the perspective of his advanced Jewish studies, sharp mind, leadership skills and community experience make him an ideal addition to the Scholar’s Program. The Memnosyne Institute, through its many programs, including philanthropy and vision for a Campus for Humanity, is an important leader envisioning Dallas as a destination city for cross- cultural collaboration, discovery and education. Congratulations to Rabbi Schlesinger on this achievement. The CoLodging Club is a new concept developed to assist baby boomers and seniors who will benefit from the social interaction, healthier lifestyle and financial advantages one realizes through sharing their home with another person. Laurie Miller, owner of Apple Care & Companion, a Dallas based non-medical home care agency, started CoLodging Club after realizing, through her connections with baby boomers who are caring for their parents, that most of them are not interested in moving to independent living complexes or assisted living facilities as the need arises. They would rather stay at home. Often times, these boomers choose to live alone, but documented studies have shown that living with someone else is beneficial in many ways. Social connections are a must for successful living; sharing life’s rollercoaster with someone else; making life easier when transitioning through difficult life stages such as divorce or loss of a spouse; it may eliminate feelings of loneliness and isolation; it is eco-friendly through the sharing of resources. Financial advantages can include: splitting rent or receiving rental income; sharing expenses such as food, utilities and other mutual expenses; having a “built-in” companion to help with the activities of daily living; sharing the cost of in-home care should it be needed; if one travels, it saves money on a house or pet sitter. There appear to be health benefits as well which include: cultivating healthier habits such as eating better meals, trying new foods and having an exercise/walking partner; building emotional connections which in turn build self-esteem and confidence; increasing happiness by diminishing depression while increasing social interaction and life enrichment. It can lead to a healthier brain and help build one’s cognitive reserves thus lessening dementia risks. CoLodging Club will hold members-only weekly live events to “mix and mingle” with other potential house mates. The events will be held in public places and will be facilitated by CoLodging Club staff. People will get to meet each other face to face and will be able to determine on their own which member might be a good fit for them to share a living space. There will also be an educational component from an expert in different fields pertinent to shared housing, such as an attorney who can advise on leases or a private investigator who can give advice on background checks. CoLodging Club is a safe alternative to running an ad on craigslist or Roommates.com. Laurie Miller was born and reared in Dallas. She graduated from The Greenhill School and The University of Texas at Austin, where she received a Bachelor of Business Administration in Marketing. She and her husband, Mark Miller (also a native Dallasite) have two children, a daughter, Corie, 21, a student at Washington University in St. Louis, and a son, Jeff, 17, who attends Plano West Senior High. Laurie and Mark have been married for almost 24 years. Laurie is the current president of The Dallas Area Gerontological Society. For additional information about the CoLodging Club, visit the website at www.CoLodgingClub.com or call 972-802-1104. For more information on Apple Care & Companion, visit their website at www.AppleCareandCompanion.com or call 469-619-5474. Good wishes are due to Zane Belyea, who joined Sparkman-Hillcrest as a Family Services Counselor. Zane, a native of Silverdale, Washington, is married to Jill Lieberman Belyea. They are the parents of two sons, Dylan, 7, and Zachary, 5. Zane received his Bachelor of Science in Psychology and Social Work degree from The University of Southern Illinois, where he played college baseball. Prior to joining the Sparkman-Hillcrest team, he was the marketing and recruiting vice-president for a cadre of career colleges. Zane likes to sit down with families and provide a free planning guide. He assists them as they assess their needs and wishes, and offers them assistance in putting a plan together. Belyea continued by saying that there is a financial benefit to pre-planning, since funeral costs and the price of cemetery plots rises annually. Typically, the cost of a Jewish funeral is between $7,000 and $12,000. Data has shown that funeral costs double every seven to 10 years. Life insurance policies do not pay for funerals; however, a pre-arranged, prepaid funeral life insurance policy can ease the burden for survivors. Zane also stated that the baby boomer generation has currently reached the time in life in which pre-planning should be more of a priority. Zane, Jill, Dylan and Zachary are members of Congregation Anshai Torah in Plano. Zane is actively involved in the Men’s Club at the synagogue. He is a member of the Youth Sports Committee at the JCC. He coaches his son, Dylan’s, baseball team, “The Giants,” and when not working, volunteering or spending time with his family, Zane plays in The Temple Shalom Softball League. He can be reached through Sparkman-Hillcrest at 214-771-6480 (dial 1). Judaism is a historical religion — that means that our history defines our holidays, celebrations and even our worldview. To understand Jews, you must understand Jewish history. The challenge is that it seems that we fall into two camps: those who love history and those who hate history. If you love learning and delving into history, then Judaism is perfect for you. Begin with the Torah and follow our people through today — it is an exciting adventure. It seems that our story is a real roller coaster — when things are good for the country we live in, the Jews contribute to society and are valued members. The minute something goes wrong, we get the blame. One of the fascinating stories is how we were blamed for the many plagues in Europe. Why were we blamed? We didn’t get sick like the rest of the population, so obviously (to them), we must have caused the plague. Why didn’t we get sick? Simple — before we eat, we wash our hands ritually. Even that small amount of cleaning helped us fight off the germs. What a great piece of history. The second short phrase that tells so much about our history is: “You may not live here as Jews.” This phrase followed us to different lands, and the phrase got shorter and shorter. First, we were told that if we convert, we could continue living in the land. Eliminate “as Jews.” Next, we were told that we had to move — eliminate “here.” And finally, in Nazi Germany, it was “you may not live.” For us, the bad times have always been really bad. So if you are part of the “I Hate History” group, what can you do to learn? There are some great books out there that make great reading. If you can get a copy of “Jewish History in 100 Nutshells,” great. There are many historical novels available today that make the stories come alive (even though they are not totally factual) – “As a Driven Leaf” by Milton Steinberg is a must read. Finally for those of us who would really like to get into the stories, I recommend Rabbi Kenneth Roseman’s series. Yes, they are for teens but they are truly involving. They are called “The Do-It-Yourself Jewish Adventure Series” and are designed for you to read a little, make a choice and then turn to the page reflecting your choice. Each time you read, you make different choices and the ending turns out differently. The stories include subjects like the Tenth of Av, the Inquisition, immigration and the Holocaust. Throughout our history, Jews have made different choices and we learn by confronting those choices. If you love history or if you hate history, our history is our family. Get to know your ancestors and their stories. Find a good summer Jewish history read. Visit the Tycher Library for some very good reads. Stein has won the Dallas Public Library’s “Express Yourself” 17th Annual Youth Poetry Competition’s 2013 Joe M. and Doris Russell Dealey Award of Achievement. Mika’s original poem “The Poet’s Burning,” was one of 1,300 student entries submitted this year. Mika’s poem has been published in the Express Yourself 2013 Journal. Among Yavneh’s many finalists in recent years of the Dallas Public Library’s “Express Yourself” Youth Poetry Competition, are this year’s recognized students, seniors Clara Moskowitz and Max Schnitzer. “We are very proud of Mika, Clara and Max, and this is a remarkable achievement,” Yavneh assistant principal Tim Cloward said. He added that Yavneh has had more than a dozen students represented in the last six years. This designation is greater than any other school in Dallas County. The son of the late Deborah Stein, and grandson of Moe Stein, Mika will spend next year representing BBYO as its 2013-2014 Grand Aleph Godol/international president before he begins his college studies at New York University. Tempting isn’t it, oh I dare! And I dare you to light me. • We love to hear from our readers and subscribers. My former neighbors, Miriam and Al Creemer, and a host of their friends created a team called “Brendan’s Buddies” and participated in the Dallas VisionWalk around Bachman Lake. The team walked in support of Miriam and Al’s grandson, Brendan Creemer, who was born with Usher Syndrome. Brendan was born deaf, had muscular delay and will eventually be blind. Brendan, now 14, has bilateral cochlear implants and can hear and speak as any healthy child. After many years of therapy, he can, run, ride a bike, swim and skate. However, he suffers from night blindness and has lost 60 percent of his vision. The Foundation for Fighting Blindness organizes the VisionWalk to support several avenues of research, including gene therapy in Israel, Europe and the United States. The Creemers hope that a cure will be found to help Brendan and many others that suffer from Usher Syndrome, Macular Degeneration and other progressive forms of blindness. More information can be found at www.fightblindness.org. Brendan’s Buddies placed fourth in fundraising for the event, raising $8,000 for the cause. Joining the Creemers in the fundraising event were members of their chavurah, “Cheyes of Texas,” who are their fellow congregants at Congregation Beth Torah. • Ourtowner Kevin Libby recently completed the Multiple Sclerosis 150 Bike Ride to help raise money for multiple sclerosis research. Kevin says that it’s not too late to contribute to this fundraising effort. Donations can be accepted through June 5. To donate online, visit http://main.nationalmssociety.org/site/TR/Bike/TXHBikeEvents?px=2673892&pg=personal&fr_id=20386. Donations by check are also welcome. Please make your tax-deductible check payable to the National MS Society and send it to 11107 Hillcrest Road, Dallas, TX 75230. Be sure to write Rider: Kevin Libby and Sam’s Club MS 150 in the memo section of your check. Zane Belyea, family services counselor at Sparkman-Hillcrest Funeral Home, shared with us that Sparkman-Hillcrest is sponsoring an educational forum to discuss “End of Life Issues from a Jewish Perspective” from 11:30 a.m. to 1 p.m., Tuesday, June 4 at the Sparkman Hillcrest Northwest Highway Location. Rabbi Peretz Shapiro will speak on the topic. Additional participants include Jewish Family Service’s Debi Weiner; the Aaron Family Jewish Community Center adult program associate Heather Cardova; VITAS’ Elise Power; and The Legacy Preston Hollow-Dallas Home for the Jewish Aged’s Cheryl Weitz. These participants will provide additional information and support. The event is geared toward a target audience of 55 and older; however, everyone is invited to attend. Zane mentioned that 20 spaces are available, and readers can RSVP to zane.belyea@dignitymemorial.com. A kosher lunch will be served. We will share more about Zane Belyea in next week’s issue. When I was growing up around the TJP layout room, there was a certain energy that permeated the air as we finalized each issue and looked for errors. Often you would hear an “ay yai yai” when mom or dad saw a mistake and you’d be on the receiving end of a “good catch” when you caught one yourself. There is a certain amount of stress that goes with putting a newspaper to bed week in and week out. To be honest with you, I sweat every Thursday when the paper comes out, which is usually when I realize or learn of mistakes not caught. When folks are kind enough to take the time to point these out to us (which we truly appreciate, otherwise, we won’t know what part of the system we need to fix) we print the correction as quickly as possible. Thanks to Hollace Weiner who shared the following about the veterans exhibit which launches this week. “This Memorial Day and throughout the summer, check out the veterans exhibit in Beth-El’s Hall of Remembrance. It focuses on local Jewish soldiers who served in uniform from the Civil War to the War on Terror. “The exhibit begins with the War Between the States and information about Jacob Samuels, an early member of Ahavath Sholom, who has a Confederate battle flag carved on his tombstone at Hebrew Rest Cemetery. Representing the Union is Simon Gabert, a charter member of Beth-El Congregation. 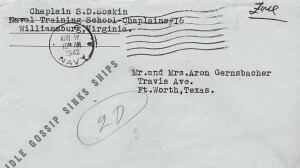 Gabert and Samuels, both cavalrymen, were the first two Jews to settle in Fort Worth. “The World War I display includes photos of soldiers Byron Gernsbacher and Edwin Schwarz, the city’s first pediatrician. Headlines from the Star-Telegram and Fort Worth Press relate how the city’s Jews celebrated in 1917 when the British captured Jerusalem. A printed program from a luncheon honoring Gen. John J. Pershing notes that the Temple choir provided the musical entertainment. “The World War II exhibit case is devoted to Pvt. Harold Gilbert, who was among 763 soldiers who perished when the Germans torpedoed a troop-transport ship crossing the English Channel on Christmas Eve. “For decades, details about the 1944 attack and even the name of the ship remained classified until books and TV shows unraveled the missteps, mistakes, and the truth behind one of the more tragic blunders of WWII. On display are several out-of-print books about the incident, including ‘A Night Before Christmas: Sinking of the Troopship SSLeopoldville.’ Pvt. Gilbert’s Purple Heart is among the medals in the display case, which is lined with the 48-star American flag that draped his coffin. “The Vietnam War display showcases memorabilia from career Air Force pilot Ken Sherwin and Army quartermaster Morty Herman. Sherwin loaned the Beth-El Archives a visor, a sash and his Distinguished Flying Cross certificate. Among Herman’s mementos are a full-page, color map of the war zone, a souvenir South Vietnam flag and a shadow box with patches, military dog tags, medals, ribbons and photos. “From the War on Terror, there are photos of Army Maj. J. Scott Baum and the text of his thank-you note to the congregation for items sent to his unit. Navy Lt. Brad Lewis is pictured on board the USS Winston Churchill, where he was chief engineering officer. Spec. Jon Haber, of the Texas National Guard, was photographed seated in Saddam Hussein’s Iraqi palace. Haber’s picture was published in the Jewish War Veterans calendar of July 2010, which is in the exhibit. Also next week, we’ll feature Marvin Blum’s recent Q&A with Warren Buffet. I’ve long believed that there are only two kinds of people in this world: balloons and stringholders. The first have big, ideas; the second tether them to the earth while finding means of implementation. The first are the dreamers; the second, the builders. Texas Torah Institute, blessed with both, honored one couple in each category at its recent 10th anniversary celebration. Rabbi Aryeh and Rebbetzin Henny Rodin are quintessential dreamers who opened their shul, home and hearts in 2003 to the first boys getting a local yeshiva education. Ivan and Melanie Sacks anchored this dream from the start and have moved it to reality — and beyond. I am not an Orthodox Jew. But I have the background to understand Orthodoxy, and therefore I admire and respect it. And I know that no community can truly call itself Jewish unless and until all streams of Judaism live comfortably within it. When I moved to Dallas more than 30 years ago, there was one kosher store, which was absolutely filthy. The overhead light housings were filled with dead bugs, and the dust on many cans was thick enough to write in. I was afraid to buy anything. … When I went home and called my Chicago rabbi for his advice, which was part serious, part in jest: “Ask if they’ll deliver, so you won’t have to see the dirt.” That’s the day I realized the most observant of our people could not be comfortable here, and the rest of us could never claim Jewish community completeness without them. Was it the chicken or the egg? I don’t know. But gradually, over the past three decades, comfort has come for those Jews who rely on clean and dependable kosher markets, eruvim for Sabbath enhancement, Orthodox synagogues in a variety of sizes and worship styles and educational opportunities to meet very specific needs. This last is where Texas Torah Institute comes in. What began in August 2003 with eight boys in two grades learning together at Congregation Ohev Shalom now boasts a student body of 55: 33 high schoolers who may leave for college after graduation; 22 who’ve opted to stay on for three additional years of advanced, intensive Torah study. Today, it’s possible for parents who want the most rigorous, traditional Torah education for their sons to find it right here. About a third of TTI’s current students are local boys who a decade ago would have had to go elsewhere for yeshiva study. But now, young men from elsewhere are heading here. Example: Aaron Yurowitz, an attorney with Hewlett-Packard, came from Queens, N.Y., to see what Dallas had to offer. More than simply satisfied, he’s become a booster of both city and yeshiva, urging friends to relocate their families here as he has done. He now serves as TTI’s president. For this last, rumors were floated that the promised but unnamed “special guest speaker” might actually be George W. Bush. Well, it did turn out to be a president: an incredibly realistic, humorous Barack Obama impersonator. Torah study is serious business, but there’s always room for some fun. Also at the dinner, the young men of TTI’s first graduating class rose as a group to pledge $18,000 for the future of their yeshiva. Talk about balloons and stringholders!